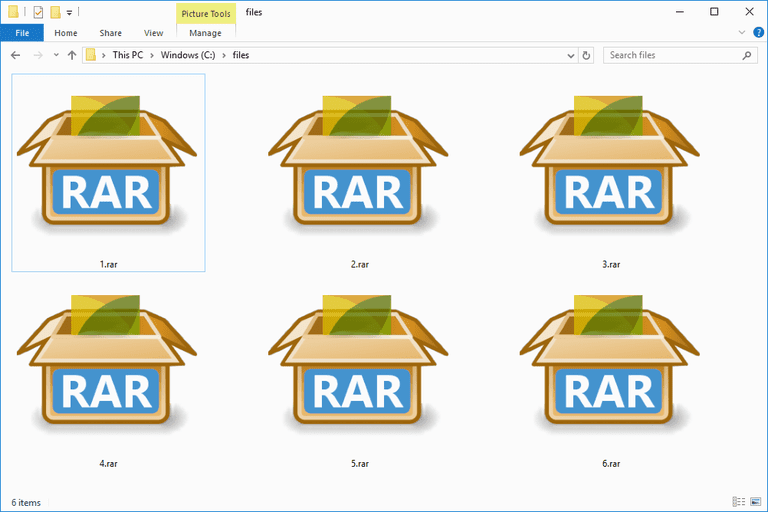 A RAR file (short for a Roshal Archive Compressed file) is a compressed file, or data container, that holds one or more other files and folders inside of it. Think of a RAR file like a regular folder on your computer, where there are sometimes many other files and folders inside of it for the purpose of organizing them. However, unlike a normal folder, a RAR file needs special software (more on this below) to open and "extract" out the contents. Most file extensions are pronounced as their individual letters, but RAR is usually treated as a word itself and pronounced as "rahr." What Are RAR Files Used For? You'll probably only run into a RAR file when you're downloading computer software. File sharing websites and software distributors sometimes put their files in a RAR file so that they can compress it down to a smaller size, allowing you to download it faster than you otherwise could. Apart from just saving on download time, RAR files can also be protected with a password and encrypted so that the contents inside of them stay hidden unless you know the password. Think of this like a little-locked box full of data, with the password being the key. Most RAR files won't have a password protecting them, being used to store images, documents, videos, or whatever type of file the author wanted. Another time a RAR file might be useful is when a friend has a long list of files they want to share with you, like photos, for example. Instead of having you download every single image file individually, your friend can first compile the photos into a RAR file and then share just that one file with you. Once you open a RAR file, you can extract out the data from the inside and then use the files like you would any other file on you computer. Windows computers don't have a baked-in ability to open RAR files. If you double-click or double-tap a RAR file without having specific software installed to open it, you'll probably see one of the following messages: "Windows cannot open this file" or "How do you want to open this type of file (.rar)?". RAR is actually the native format of an archive program called WinRAR. The only problem with using WinRAR is that it's not free! Before you run off and buy it, however, you should know that there are plenty of free RAR openers that can do the exact same thing but at zero cost. I've used a lot of un-RAR tools and, in my opinion, the best is the free 7-Zip program. Some RAR files are multipart files and are named something like 123.part1.rar, 123.part2.rar, etc. Those types of RAR files should also be able to open with the programs I mention below. Download 7-Zip. Once installed, you should set it up to automatically associate itself with RAR files so that, going forward, you'll be able to just double-click or double-tap a RAR file anywhere on your computer and it'll open automatically in 7-Zip. Do this by opening 7-Zip File Manager after installing the program in Windows. From the Tools menu in 7-Zip, choose Options..., and then select rar in the list of file types. Then click on the Plus button for either the current user or all users (or both). A little disk icon will appear next to rar in the list. Save the changes with the OK button. If after doing this, 7-Zip still doesn't open RAR files when you double-click them, see How Do I Change the Default Program for a Specific File Extension? for help. If you go this route, you'll need to know the install location of 7-Zip File Manager, which on most computers will be "C:\Program Files (x86)\7-Zip\7zFM.exe". You can also open RAR files with 7-Zip by right-clicking on them and choosing 7-Zip > Open archive from the pop-up context menu. Note: If you're dealing with multipart RAR files, first select all the different parts of the RAR file and then right-click one of them. From that menu, choose 7-Zip > Extract files. 7-Zip isn't the only free program that can open RAR files. PeaZip and jZip are two alternative RAR openers. Mac users should be able to download and use Keka, The Unarchiver, or RAR Extractor Free to unload RAR files. Another method is to use Unzip-Online, which lets you open RAR files without having any software installed, thanks to the fact that it works through your web browser. More download links to free RAR extractors can be found in this list of free file extractor programs. WinZip Free is often suggested as a free RAR opener, but it's really just trialware. There's no reason to use trial software or buy a RAR extractor when there are plenty of completely free ones, many of which I mentioned above. As I mentioned above, some RAR files can be secured behind a password. With those RAR files, you'll need to enter a password before you can unpack the files out of the archive. One problem with password protecting a RAR file is that you may have made your own RAR archive and secured it with a password, but have since forgotten what that password is! This is where a RAR password cracker comes in handy. One particularly effective, and completely free, program that can break the password on a RAR file is RAR Password Cracker Expert. It can use a brute force and/or a dictionary attack (with included wordlists) to attempt every possible angle at recovering the password. Lots of different options let you customize how the different attacks should work. If the above program isn't able to unlock your RAR file, you should give Free RAR Password Recovery a try. It uses brute force to make guessing attempts at the password. It supports trying numbers, symbols, capital letters, latin, and spaces. To convert a RAR file means to change it from a file with the RAR extension to a file with a different extension, usually 7Z, ZIP, LGH, TGZ, TAR, CAB, or some other archive format. Before we get too far into RAR converting, I want to clarify something important. There's no converting from a RAR file to a non-zipped format. Spend much time searching around for RAR files and you'll see search suggestions like "RAR to MP3 converter" or "RAR to PDF converter" ... none of which actually exist! Like I've already talked about, a RAR file is similar to a folder that contains other files. If your RAR file contains MP3 files, for example, you must open the RAR file, not convert it, to get the MP3s. See the How to Open a RAR File section above to learn how to actually unpack the MP3s (or PDFs, or whatever is in the RAR file that you want access to). Now, if converting a RAR file to a ZIP or 7Z file (other archive formats) is actually what you want to do, keep reading... there are a few ways to do this. The quickest and most effective method to converting a RAR to ZIP, or any other common archive format, is a free file converter like Zamzar or FileZigZag. These two RAR converters are online services, which means you just upload the RAR file to the website and then download the converted file. A free online RAR converter is perfect if the RAR file you're working with is small, but you probably don't want to use an online converter on a large RAR file. You'd first have to wait for the RAR file to upload and then wait for the converted file to download, something that might take quite a while for a really large file. If you're converting a large RAR file, I recommend using a free tool like IZArc. It's super easy to convert a RAR to 7Z, or one of several other archive file formats, from IZArc's Tools menu. Finding a free tool that can build a RAR file isn't as easy as finding one that can open RAR files. This is because software developers must have explicit permission from Alexander Roshal (the copyright owner) in order to re-create the RAR compression algorithm. The best suggestion I have for creating a RAR file is to use the trial version of WinRAR. Though it's a timed trial, technically valid for less than 30 days, it's the easiest way to build a new RAR file. We would generally recommend that you choose not to compress files in the RAR format, mostly because there are so many other, more widely available, compression formats, like ZIP and 7Z. Though you probably won't ever find one this large, the maximum file size of any RAR file is just under 8 exbibytes. That's over 9 million terabytes! Chrome OS is one operating system that natively supports RAR file extractions, much like how Windows natively supports unpacking ZIP archives. This means Chrome OS can get files out of a RAR file without using any third-party software.